Using the Advanced Trader with FireTip to Trade Futures and Commodities. Firetip is a FREE Trading Platform. No volume or deposit minimums. Runs on a Windows or MAC OS computers. The Advanced Trader enables you to watch the market dynamics and trade with our customized "One Click Trading" technology. You can get quotes, watch market movement, trade, and view your positions for individual markets, all from the Advanced Trader window. Control your trades simply and nearly instantaneously from the Advanced Trader. FireTip provides the Advanced Trader and is a FREE Futures and Commodity trading platform. There is no monthly minimums or deposits. 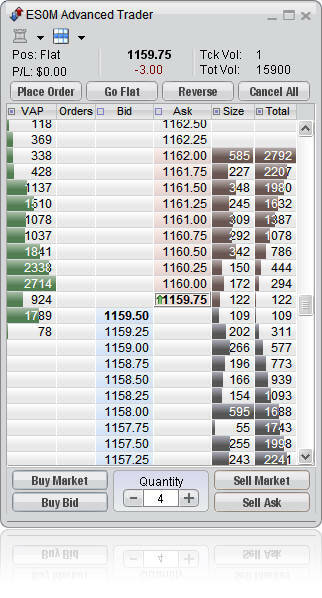 Liquidate (go flat) on all positions with one click..
With one click cancel all pending orders. Place limit or stop orders just by clicking on the desired price of the market you're viewing. Futures Trading Platforms is a deep discount online Futures Trading Broker providing FireTip for FREE. There is no software charges when you use FireTip with Futures Trading Platforms. We provide FireTip for FREE!